As we meandered through the winding bayous of the Manchac Swamp in pitch darkness it was hard to imagine what the sun would uncover that morning. 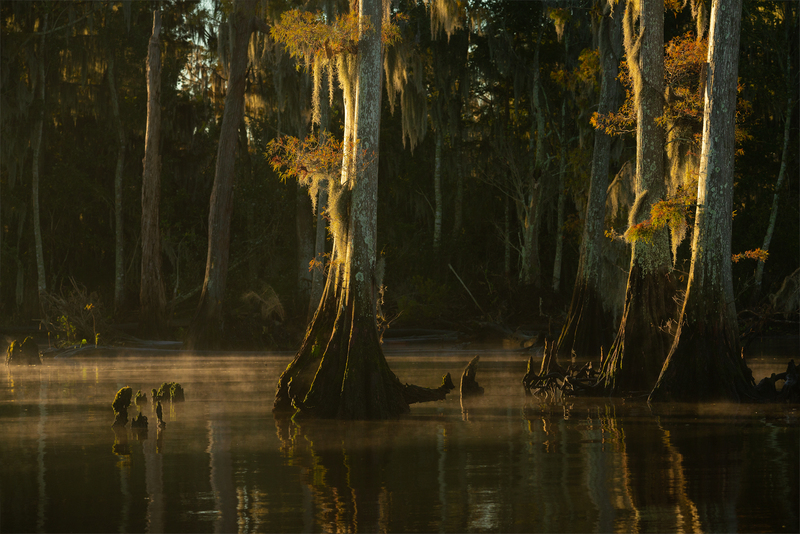 The crisp fall air cracked against the warm swamp water and mist began to rise into the cypress trees. As the sun broke the horizon it ignited the golden fall foliage of the bald cypress trees on fire. What a beautiful morning exploring the swamp with a group of eager photographers. For about a month from early November into December the first fall cold fronts that hit Louisiana provide landscape photographers with just the right combination of cool weather and red cypress trees shrouded in fog. If you would like to make a trip to these beautifully scenic swamps, we can get you there to capture those fleeting moments!